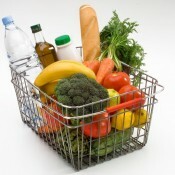 With food prices on the rise, it can be tempting to pay for groceries using a low interest rate credit card. While this is quick and convenient, it could leave you in debt if you don’t clear your bills in time so it’s essential to keep your costs low to start with – here’s how. If you’ve ever popped to the shops for washing-up liquid and come out with vegetables, sausages, chocolate, fizzy drinks and other snacks, you’ve probably fallen victim to one of the many tricks used by consumer experts. That’s right, time, effort and money is spent each year ensuring we buy as much as possible – so it’s time to fight back by knowing the trade secrets. Firstly, if you’re prone to making impulse purchases, stay away from sweets by the till as these have been placed there to tempt you while you wait. Secondly, always look on the top and bottom shelves as more profitable items will normnally be positioned at eye-level (sneaky indeed). Thirdly, don’t get drawn in by every special offers or deals that might only save you a few pennies. Sometimes, it’s better to purchase a non-branded item that’s not discounted than to buy a well-known item in a sale. Finally, stick to the items on your list and avoid all the colourful, attractive-looking products they place at the end of each aisle – they are there for a reason. Are you getting the best value for money? If you’re not sure, it might be wise to download one of the many shopping apps available. These clever tools will help you compare prices between stores, locate discounted products and keep track of your shopping bill as you go. Tesco Calc Lite, for instance, allows you to scan items as you put them into your trolley, so you can be sure you have enough money when you get to the till! As if that’s not enough, you can even compare big-name brands online and fill your virtual shopping basket full of great value items. Shopping with a rumbling tummy can be a disaster. You’re more likely to make unnecessary purchases, including cakes, pastries, cookies and other calorie-laden snacks when you’re hungry, so make sure you eat before you head to the shops. If you don’t have time or get peckish while you’re browsing the aisles, pop into a supermarket cafe for a snack. This should satisfy your cravings and ensure you don’t have to apply for a credit card just to support your next shopping binge! If you’re looking to save cash throughout 2013 and beyond, these tips are definitely worth remembering.